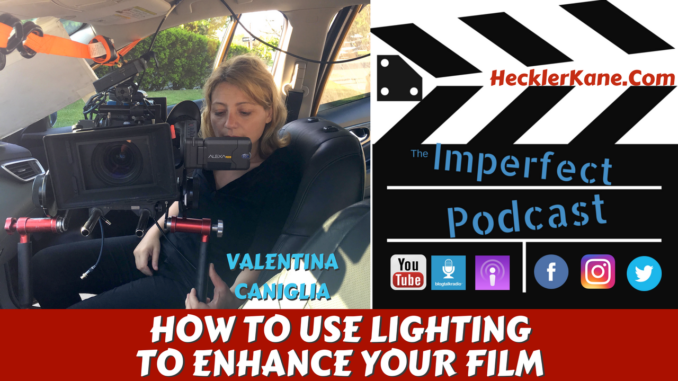 Cinematographer, Valentina Caniglia has worked on over 60 film productions, documentaries, music videos commercial work and more. She is known for her work on the film “The Stand” where her astonishing lighting and camera work caught the attention of American Cinematographer magazine which featured an exclusive article in March 2017 issue. As a DP (Director of Photography). Valentina is the real deal and brings her positive attitude to her work and life. We discussed the challenges of shooting on location in Palestine to being snowed in in New Jersey. Her eye for coloring and lighting are what makes Valentina’s work unique and why she’s won so many awards. As a female cinematographer her journey to success has not be so easy. “Pomegranates and Myrrh” winner of the Golden Dagger for Best Cinematography, premiered in USA at Sundance film Festival and received the Audience Award at Doha Tribeca Film Festival handed out by Robert De Niro. “Madeline’s Oil” was the winner of the Best Cinematography award at the Louisiana International Film festival. Where did you catch the filmmaking bug? In reality, my father wanted to be a Director so I took a lot of inspiration from him. Then I realized his dream became mine. Is film school in Italy difficult to get accepted to? I didn’t go to film school in Italy. I came to New York after London and majored in film at New York University. I think it was mostly paintings coming from a country where art is important. There was a lot of influence when I saw these paintings in Italy and all over Europe. I realized I wanted to be a cinematography because I wanted to work with lighting. I wanted to recreate what these artists were doing on the canvas. How did the film Blindness include your love of art? Blindness was interesting because it was about a woman who was losing her sight. We had to tell the story with visuals and not many words. The camera was capturing what she was seeing but not very well. It was a long journey because I had to see beyond what we see normally. What I said to the director was sometimes what you don’t see is more powerful than what you do. I like European film because isn’t a lot of dialogue and there’s more visuals. It’s also nice to see how independent films are being done in the United States as well. What is your relationship with the lighting crew? When I decided I wanted to be a DP (director of photography) I made a point to meet all the lighting rental businesses and owners. I knew I really cared about lighting so I wanted to explore how I could get them to give me what I needed and also new equipment that’s becoming available. It’s also important to say you don’t need a lot of light, you just need the right light to make it work. How much interaction do you have with the director on set? We do a lot in pre-production where the director will tell me what he or she wants in terms of mood and movements. I anticipate and interpret what they want while reading the script and translate the words into visuals. I write my notes and compare each scene and character. Sometimes I give each character a color to identify them because I see their personality. It’s a visual way to tell the story and the director how I see it. During pre-production they have the final say and that’s when they’ll let me know if they like my idea or maybe need to go another way. It’s important to listen to what the director wants. How important is still photography for setting up your film shoot? It’s actually very important because I like to capture the moment. Things may look very well lit but sometimes I just observe what’s around me and I just snap it. It depends on the situation as well. If I shoot a documentary I like go and explore right in the moment. To be honest, I’m coming from a culture where everything can be done in the moment and I’m not afraid of that. Basically we live day by day and I like to take this approach to film as well. Maybe in that moment even though you do a lot of pre-production, it may not work the way you and the director thought. You have to be ready to have a plan B, plan C, and plan D as well. Maybe the actor doesn’t want to do certain things so you just have to come up with an idea. I shot a movie in Palenstine behind the wall. In a place like that where theres a lot of bombing, I realized to get the story out there you have to think in the moment. What was the most challenging shoot you had to film? I always translate the worst into the best. It’s survival. You have a lot of support and never give up because you want to make something good. Even if you have a big budget, it’s not going to be any easier. The producer may be afraid to take more risks. What award did Madeline’s Oil win at the Louisiana Film Festival? Madeline’s Oil was a period piece about slavery and racial discrimination. I loved it because we shot all over the fields and in the mud and every swamp in Louisiana after the hurricane. In that moment you will see people were all united including the actors. It’s challenging because you really have to deal with what you have at that time even though we had a bigger budget. The film won Best Cinematography at the Louisiana Film Festival. I’m very happy about it and love Louisiana. I actually shot another film in Louisiana called The Stand. It was interesting because it was all shot on a bus and there was a terrorist attack with Christians and Muslims all together. They had to make it look like they were all the same people. We shot in Louisiana where it was supposed to look like West Africa. Big fields with dirt roads. I really relied on natural light and worked a lot with mirrors. I say it was easy but it really was not. Buses are wider in the United States so I thought I could put up a light but I didn’t count on every seat being occupied. I couldn’t put up any light whatsoever and the windows were small. I actually put the mirror on the ceiling creating triangles of light using what I had. You have to worry when you see the faces of your Gapher, your Key Grip and First AC go pale and they don’t actually know how to tell you the problem. When you see that you start to see there is a problem. What challenges did you face breaking into the industry? As a woman cinematographer it’s difficult to break in because especially when I started in 1998, I was one of the few DP’s around. Every time I was on set I was the only woman on set. I had discrimination but I didn’t have much because I also had a lot of people that believed in me and supported me. I’m bothered by women who don’t support each other as men do. I used to have a big shirt over my shoulder but I’m a boxer and they didn’t know. A lot of women would start to panic wondering if I could do it. If you train it’s not about the strength it’s about the power you have from your legs as well. What is your go to camera? I think it really depends on the project. I can’t always say I want to use a particular camera. I do prefer the Alexa. My work is not all the same. Every story calls for a different cinematography style. You have to go with the story. You can use any camera really, it’s about the story. I shot a TV pilot with Joseph Sikora. I thought I wanted to shoot with an Alexa but I did some tests and showed the director how it looked with a Red anamorphic lense and we just liked that much better. What is your new film Amytal Therapy about? The short film I just directed and DP called The Amytal Therapy. It’s about a woman who has a double identity looking for the murderer of a companion. She’s a psychiatrist, living in New York that spies on her own patients, though the security cameras she’s personally installed in their homes. She knows what they do. She knows what they want. She knows how to stop them. The good thing is if I wanted to put someone in the darkness I didn’t have to turn around and ask someone. The bad thing is I didn’t have a companion. I really did miss the collaboration between directory and cinematographer though. It’s amazing because you have someone who covers your back. I think my next move I want to continue to be a DP (Director of Photography).